Sathya Sai Baba – amazing sun miracle photographed? Sathya Sai baba sun miracle? This photo is regarded by many gullible Sai Baba devotees as a ‘miracle’. Nothing could be more obvious than that this is a composite image made by some devotee. 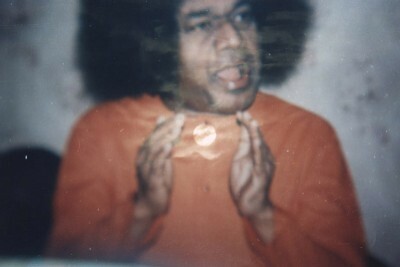 Look at the bit of cloud that crept in to shade Sai Baba’s right jaw – no doubt when the sun image came into the photo. In fact, the photo appears to be a double exposure, since wisps of cloud cover his face and hair too. Double exposure effects are easy to produce with graphic software such as Adobe Photoshop, of course. One wonders why devotees feel it necessary to try to deceive the public with such nonsense. The above image was originally found here. but Sai people soon got the image removed (too obvious a fraud). It is similar to another manipulated image claimed to show Sathya Sai Baba appearing in the sky from the window of an airliner in South America which nearly came to grief but was supposedly ‘saved’ by him (see photo, details and comments here). Incredibly uninformed, Sai Baba himself actually proclaimed that “beings live in the sun“!! and “In all the universe there is no other planet that has human life, or a similar life form”. Then said later “Elsewhere in the Universe, life feels it is Divinity”. Sai Baba often contradicts himself flatly on many major issues – followers choose which version they want to believe! IMPORTANT NOTICE! Sathya Sai Baba’s involvement in ordering the execution of four devotees in 1993 has been confirmed as known to many ashramites by Divya who lived for years with his sister, Venkamma, and was her long-term helper right to her deathbed. The next day Sai Baba delivered Rs 50,000.– to every family member and other residents at Prashanthi. SAI BABA MOON MIRACLE AT HIS OWN FUNERAL? SATHYA SAI BABA “GREEN DIAMOND” FOR ROBERT PRIDDY The alleged ‘green daimond’ in the ring given in 1986 to Priddy was examined by Mr. Peter Hertz, the Danish Queen Margarethe’s jeweller, a top Scandinavian expert on precious stones and diamonds. This entry was posted on June 19, 2008 at 9:57 am	and is filed under Guru Cult, Miracles. Tagged: Sathya Sai Baba. You can follow any responses to this entry through the RSS 2.0 feed. You can skip to the end and leave a response. Pinging is currently not allowed.